Since October has come in so quickly I realized that it really is fall. 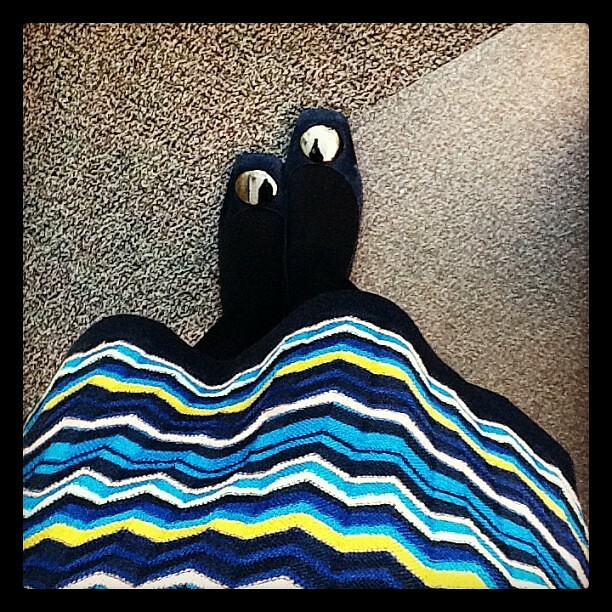 Today I thought was a perfect day to pull out my Missoni for Target dress that I scored. I know a few bloggers who said they didn’t buy anything from that Target line because they didn’t want to look like everyone else but I actually love how different everyone rocks their pieces. I’ve seen dresses belted with contrasting color cardigans added. Bold tights, bright tights, dark tights (I went with navy blue and navy blue wedges today). That’s the great thing about personal style, everyone’s is different, so I don’t even think about how anyone else would wear something. No one will ever wear it exactly like I do. I really do like this dress since it has more of an a-line cut to it, so it doesn’t cling to my backside (one of the main reasons I rarely buy sweater dresses). And I love the wild and crazy print and the blue, yellow and pink color palette. Of course now I want to wear it with pink oxfords I saw at Fossil or even an awesome pair of pink, yellow or turquoise tights from We Love Colors. Today’s combination is very simple, just my navy tights and wedges and a Dooney & Burke bag with lots of bumble bees on it. No necklaces or an arm full of bangles, just a white Swatch. Maybe next time I’ll pair it with something more bold for today, I think this is perfectly me. Yay Missoni for Target! I agree, everyone wears the pieces differently and I have yet to see anyone else even wear something for the collection in this area! I got this same dress, I have yet to wear it but I love the way you did! I’m thinking i might wear mine with navy tights, some mary janes, and a skinny pink or yellow belt. wow this is cool and i love this..